Unveil the truth about a deceitful King and become a member of the Bards College. Learn about the Festival and Jarl Elisif the Fair's plan to cancel it. Travel to Dead Men's Respite to receive a missing Verse. Return to the Bards College and pay a visit to the Blue Palace. 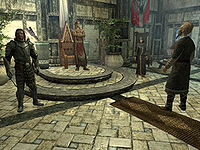 All over Skyrim, the Bards performing at the various inns and taverns will point you towards the Bards College in Solitude. When you enter the building, you will be greeted by Headmaster Viarmo; he will explain a bit about the college and will proceed to hand you a task as part of your application to join. He explains that the ancient college ritual The Burning of King Olaf has been canceled due to the recent assassination of High King Torygg. The grieving widow, the recently appointed Jarl of Solitude, Elisif the Fair reasons that burning a King in effigy is distasteful at this time and wants the festival shut down. 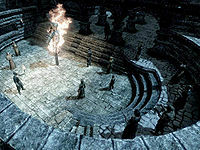 The Festival itself is centuries old and is, according to Viarmo, held to celebrate Solitude and the heroic acts of the mythical King Olaf who apparently slew Numinex, a fearsome dragon who terrorized Skyrim during the First Era. To ease the mind of Elisif and thus save the Festival, Viarmo wants to recite King Olaf's Verse, originally a part of the Poetic Edda, but lost for thousands of years. The Poetic Edda is a living history of Skyrim, written by each bard studying at the College and as such, a precious item. King Olaf's Verse was Svaknir's contribution to the Edda and dared to question the heroic acts of King Olaf, the very King to whom the Festival is held. Because of the Verse, King Olaf sentenced Svaknir to death and all copies of the Verse burned. The residing Dean of History, Giraud Gemane, suspects that the lost Verse can be found inside Dead Men's Respite, which he also believes to be the burial tomb for King Olaf himself. The ancient barrow is located in the mountains southwest of Morthal and you will, immediately upon entering, notice a strange ghost wave at you, then disappear through the sealed entrance to the north. 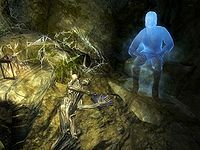 Pick up the Ruby Dragon Claw from the table, which will cause four of the previously dead draugr enemies to reanimate and attack (you can kill them by sneak-attacking them before taking the claw), but will also raise the gate and allow you to follow the ghost. It soon becomes clear that the ghost shows you the correct path, so follow it and pull the chain at the dead end. The next area is a maze-like tomb where you will have to pull several chains to open up different areas. Use your map to your advantage and make sure to access the easternmost room for a copy of the Speech skill book The Buying Game, guarded by a well-placed Battering Ram. Watch out for several draugr and frostbite spiders and continue north. Beware of the pressure plate at the foot of the stairs, which will release a flame trap. Fight the spiders in the next room, loot the shelves for some potions and soul gems then pull the chain, which will open the grating in the floor and reveal a watery pit. Take the jump and proceed forward to a chamber with several enemies, including an archer on the ledge above. Proceed to the level above and open the gate, which will trigger several swinging blade traps (at the bottom-right corner of the gate you will find a trigger for the trap, which you can remove by picking the adept lock), so cross the bridge carefully and pull the chain to make them stop. Go up another level and open the huge door. At the end of the next tunnel, use the Arcane Enchanter if you must, then turn around and watch your ghostly guide disappear through another doorway to the right. Due to a magical seal the door ahead of you is blocked, so make your way through the doorway to the right and through another set of catacombs to fight the residing draugr. The locked door hides a master-locked treasure chest, with a boss-leveled amount of gold. In the next chamber, the gate will shut behind you and five draugr will attack. After the battle, explore the southeastern room for a chest, but beware of the dart trap protecting it. Pull the chain and head down the path. Activate the handle and watch the rock wall lower and behold the sight of the ghost sitting next to the mummified corpse of Svaknir, the Bard executed for questioning the King in ancient times. You cannot interact with the ghost, but the corpse still holds the forbidden Verse, so claim it and learn the truth behind the annual Festival in Solitude. As soon as you take the Verse, the ghost disappears and you will have no choice but to backtrack through the Catacombs. On your way back, you will encounter the Ghost of Svaknir near the magically sealed door. He will turn towards the door, break the barrier, and run headfirst into the Chamber. Follow Svaknir to a Nordic puzzle door; it is finally time to investigate the Ruby Dragon Claw you found when you initially entered the barrow, so take an extra look and you will find the symbols Wolf—Hawk—Wolf, so adjust the corresponding images for the three rings on the door, then insert the claw in the keyhole. Proceed forward and equip yourself for a lengthy battle. Arise, Olaf! My vengeance is at hand! This will make the four draugr on the ledge rise and attack, so once again help Svaknir get his revenge. These draugr are all higher level than the first ones, but Svaknir will once again prove his skills and help you defeat them. When they are dead, he will finally shout out: "Olaf!" This will finally cause Olaf One-Eye himself to burst out of his coffin screaming: "Insolent Bard. Die!" He will then attack the both of you, so do your best to avoid his attacks and beware of his ability to disarm you. He can be a tough opponent, but will eventually fall to the ground and die. The tormented soul of Svaknir will finally be set free; he will head to the nearby door, pull out his lute and disappear in a ray of light. Loot Olaf's corpse for a leveled weapon and the key to his treasury, then examine the wall behind his coffin to learn a word of Whirlwind Sprint. Unlock the treasury door and examine the area for considerable loot, then pull the lever and make your way out of the barrow. Back in the College, Viarmo will be overwhelmed with joy when you hand him the Verse, but will soon be disappointed. He complains about the quality of the rhymes themselves, and, even worse, that some of the writing is unreadable due to age. He will, however, accept a suggestion about making the missing parts up, simply to save the Festival. The next step will involve him reciting the poem and you making up the missing parts. Reading the book Olaf and the Dragon, found in the upstairs library, will give more background about the deceitful King. Although there is no correct version, how much the court likes what you make up will affect your reward. The persuade options in particular will be very well received at court. 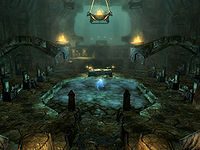 Once Viarmo is convinced that the Verse is worth reciting to the Jarl, he will leave the College and head towards the Blue Palace, inviting you along. Each choice gives you the listed number of points (the higher the number, the better the verse is received). The total of the two choices determines your reward. In the Blue Palace, you will find Viarmo in the lobby, waiting for his audition with Jarl Elisif the Fair. Ask him if he's ready and follow him up the stairs, then watch while he recites the embarrassing truth about the legendary King Olaf to the Court. "O, Olaf, our subjugator, the one-eyed betrayer"
No shouting match between dragon and man, no fire or fury did this battle entail. (Olaf found Numinex asleep): Olaf captured a fast-sleeping dragon, a mighty feat which the meek would not fail. (Olaf made a deal with Numinex): Olaf struck a deal to make himself king, Numinex let go though none tell that tale. (Olaf was Numinex. A dragon in human form! ): Olaf was Numinex in human form, on moonless nights he would spread wings and sail. The "convinced Solitude to attack" and "sacked it in dragon form" options are both bugged, causing the "disguised troops" line to be read instead. See the bugs section for more detail. (Olaf ordered disguised troops to attack Solitude): Olaf gave orders, Winterhold disguises. An attack on Solitude total destruction to follow. His men dressed up and then went out to fight, but they reversed Olaf's orders much to Winterhold's sorrow. (Olaf convinced Solitude to attack): Olaf sent word to Solitude's Jarl, cajoling and mocking and begging for a fight. From Winterhold Olaf had sent every message, upon attack he was nowhere in sight. (Olaf sacked Winterhold and used magic to blame Solitude): Because Solitude would not soon bend knee, Olaf would hurt them while his status accrued. He sacked Winterhold his only true ally, and used magic bold to blame Solitude. (Olaf sacked it in dragon form! ): Because Solitude would not soon bend knee, Olaf would hurt them while his status accrued. He sacked Winterhold in dragonform, and bent their minds to blame Solitude. So ends the story of Olaf the liar, a thief and a scoundrel we of Solitude commit to the fire. In Solitude bards train for their service, they also gather each year and burn a King who deserves it. At the conclusion of the verse, Elisif will admit that Olaf was indeed a thief and a scoundrel and that the Festival is a celebration of Solitude and a condemnation of false Kings. She will reinstate the Festival and promise Viarmo a decent reward for the College. Viarmo will then turn to you and express his gratitude, even if he still will not promote you to Bard; you will have to wait until the Festival, when he will declare you a Bard in front of all College members. "With the lighting of the effigy..."
He then tells you to seek out Jorn and tell him to finish the preparations for the Festival. He will then leave Blue Palace and you are free to decide when to start the festival. Back in the College, Jorn will be excited about the news and will start right away, with a request to meet him after dark, and then the festival will be on. Wait around until 8 PM then approach him again. He will then lead you around the College, to the courtyard where every member of the College is gathered, along with several residents and the resident Bards from the local inns. Talk to Bendt, Sorex Vinius, or Evette San for free snacks, then watch and listen as Viarmo sets the effigy on fire and declares you the newest addition to the Bards College. All guests will applaud and Viarmo himself will seek you out and explain that several College professors will have jobs for you and that the burning of the King will now be a weekly event. Finally, he will hand you your reward, a leveled amount of gold, and leave you alone with the burning King Olaf. If the quest Bound Until Death is active, it must be completed before the last step of this quest, as Jorn will tell you to wait until the marriage in the temple is over. The Ruby Dragon Claw and King Olaf's Verse will remain marked as quest items and cannot be removed from your inventory until Viarmo receives King Olaf's Verse. The court scene in this quest can come into conflict with the beginning of The Man Who Cried Wolf. It is a good idea to make sure you visit the court at least once before setting off for Dead Men's Respite. You don't need to do anything except hear Varnius Junius ask the jarl for help; once he's left the court, everything should be good to go for Viarmo's reading. During the festival, Sorex Vinius will be handing out free meat pies; however, as meat pies do not exist in the game, you will actually receive an apple pie from him. Version 1.2.3 of the Unofficial Skyrim Patch adds meat pies as a replacement item for this quest. During part of Season Unending, Elisif is away from the Blue Palace. If this has happened, you should complete that quest before going to Dead Men's Respite. Sometimes King Olaf's verse will not be found next to Svaknir's body, with the indication arrow pointing to where it is supposed to be. If the book appears to be absent, it is embedded in the ground. A fireball or other explosion may dislodge it. After he triggers the first wave of draugr, Svaknir might simply stand in the middle of the room with King Olaf's body, not triggering the next wave. ? Attempting to damage him may cause him to proceed. He is immune to Unrelenting Force. 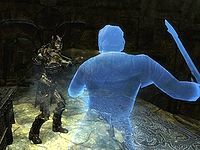 If you choose "He convinced Solitude to attack Winterhold" for Choice #2, the recitation and scoring will both act as if you had instead selected "Olaf ordered disguised troops to attack Solitude?" and as if you had selected "Olaf made a deal with Numinex" in Choice #1, regardless of what you had previously chosen. The line that should have been read for this choice cannot currently be heard in game. If you choose "Olaf sacked it in dragon form!" for Choice #2, the recitation and scoring will both act as if you had instead selected "Olaf ordered disguised troops to attack Solitude?" The line that should have been read for this choice cannot be heard in game without the USKP. This also makes the highest reward unavailable, though your Speech skill will still be advanced normally for a Persuade check if you choose this option. 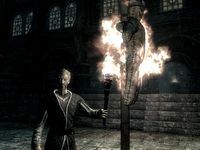 When he burns the effigy, Viarmo may tap it with a hammer rather than applying the torch, then after completing the quest he will still be seen holding the torch he used. To fix this use console on Viarmo, then type: first removeitem 0001d4ec 1, second equipitem 0001d4ec, and third removeitem 0001d4ec 1. Viarmo may not read out the verses at all, and when you speak to him in the Blue Palace, it will sometimes skip to the next part, as if he had made his performance. This doesn't affect the rest of the quest at all, but could be related to the Civil War questline. Viarmo approaches the throne to read out the verses but the jarl is not present. Viarmo stands in front of the throne and does not say the verses. He will say "not now" if approached. This will happen if you have begun the Season Unending quest and Elisif has gone to High Hrothgar for the negotiations. Going to High Hrothgar and completing the negotiations returns her to Solitude to hear Viarmo. Otherwise, simply waiting for an hour may fix this. Wait without using the "wait" function and they will all walk in. If that doesn't work, you can commit any crime to incur a bounty (just a small one will do), and then pay it off. The court will leave as if he read the verse and you can continue the quest. You can use the console to move the jarl to you by entering prid 000198C1 and then moveto player. If you take the dragon claw before the ghost disappears the draugr may not rise and the door won't open. When Viarmo burns the effigy, it is possible for him to repeat his burning animation indefinitely, preventing the festival from finishing. Talking to him may allow you to continue the ceremony but he may be permanently stuck. ? Disrupting the crowd gathering for the festival before it starts (e.g. attack people with a shout and then calm them with a spell) may fix this. Another way to fix this loop is to use the console command kill on Pantea. After closing the console, she will fall dead. Go to Viarmo and talk to him; he will stop setting the fire and finish the quest. To revive Pantea, simply return to her and use the command resurrect 1 on her. Alternatively, you can use kill and resurrect 1 on Viarmo to have a similar, if not more, immediate effect. Viarmo is essential, so he will not die but instead go into recovery mode. This may also be fixed by targeting Viarmo in the console and using the disable command followed by the enable command. Before Pantea arrives at her position in the festival but after Viarmo starts his speech, use disable on Pantea. After he says "...he becomes a full fledged member of the.." you can re-enable. You may also complete the quest through the console after speaking to Jorn in order to start the festival. Jorn will leave the Bards College to set up the festival, and once he leaves, enter the console and write the following: completequest ms05, upon leaving the college the festival should be set up. Then run to Viarmo as he will start his speech about the burning. Quickly, open your map and fast travel to a location and then back. Once you arrive, Viarmo will have completed his animations and welcome you to the Bards College. (This will allow you to attend the festival as well as complete the quest). The Official Game Guide lists the "Gift of the Gab" reward for this quest, though it does not work in the official release. This issue has been addressed by version 2.1.3 of the Unofficial Skyrim Patch; a reward was added that causes Speech to increase 15% faster. The Quest has finished, but still NPC seem to keep the Festival running every Night. Do not sleep anymore and are stuck in the Festival dialogs ? 75 I have applied at the Bards College. As part of the Application, Headmaster Viarmo wants me to find and bring to him King Olaf's Verse. 125 I have applied at the Bards College. As part of the Application, Headmaster Viarmo asked me to retrieve King Olaf's Verse. Parts of the verse have decayed, I must help Viarmo reconstruct it so he can present it in court. 150 I have applied at the Bards College. As part of the Application, I helped Headmaster Viarmo reconstruct King Olaf's Verse. I should go watch Viarmo present the verse to the court at the Blue Palace. 175 I have applied at the Bards College. As part of the Application, I helped Headmaster Viarmo reconstruct King Olaf's Verse. The court has accepted the Verse I should speak to Viarmo about my application. 200 I am to be inducted into the Bards College at the Burning of King Olaf festival. I've been told to speak to Jorn who is preparing the effigy of King Olaf. 225 I am to be inducted into the Bards College at the Burning of King Olaf festival. Unfortunately the festival cannot begin until the effigy is done and Jorn will not complete it without General Tullius' Coat. I must steal the coat and return to Jorn. 250 I am to be inducted into the Bards College at the Burning of King Olaf festival. I must speak to Jorn who is in charge of preparing the Effigy. 254 I am to be inducted into the Bards College at the Burning of King Olaf festival. Unfortunately the festival cannot begin until the effigy is done and Jorn will not complete it without General Tullius' Coat. I must place the coat on the effigy. 255 I am to be inducted into the Bards College at the Burning of King Olaf festival. I should attend the festival in the Bards College courtyard in Solitude. 300 Finishes quest I have been inducted into the Bards College in Solitude. The following empty quest stages were omitted from the table: 0, 10, 90, 145, 265, 290. On the PC, it is possible to use the console to advance through the quest by entering setstage MS05 stage, where stage is the number of the stage you wish to complete. It is not possible to un-complete (i.e. go back) quest stages, but it is possible to clear all stages of the quest using resetquest MS05.